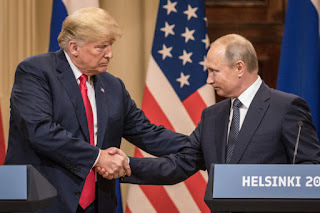 When President Donald Trump and Russian President Vladimir Putin met in Helsinki Finland, the main question everyone wanted to be answered was "Did Russia interfere in the 2016 U.S. Presidential election?". Even though Putin expressed that he would have preferred for Trump to win over Clinton, Donald Trump stated that he did not believe that Putin interfered, and said that he couldn't think of a reason for Putin to have interfered. After criticism from the public and media, he later backtracked on his statement saying that he meant to say the opposite. This, to many people, seemed insincere and a backup statement so that he would stop facing criticism. The problem with his statement in Helsinki and his backtracking afterward is how the American people consume the media. We live in an age of rapid-fire news stories and headlines. If people see that he said couldn't but didn't see the statements saying he meant to say could, could mislead the American people. Many news organizations will release a followup, separate story instead of revising the original. This increases the probability that they will not see the followup as well. What do you think of Donald Trump's conflicting statements recently? As much as this Blog is me putting in my two cents, I also want to know where you stand on the issue. America's 51st State: Who Will Take the Title? Ever since Hawaii joined the Union in 1959, there has been talk of what the fifty-first state will be. Will it be Puerto Rico, one of America's prizes after the Spanish-American war, Washington D.C, the nation's capital stuck in a limbo of under-representation in Congress, or American Samoa, a key American military base with its inhabitants waiting to be citizens? In this article, we will explore all options and the likely hood of these scenarios happening. Why We Should NOT Lower the Voting Age One of the recent ideas to come out of the left in America is the proposition that we should lower the voting age to 16. I and many others, personally find this idea absolutely appalling. As a 14-year-old deeply invested in politics, even I find the idea of lowering the voting age to be stupid, and not very well thought out. While America does need to take a look at what the teens and young adults who are not able to vote think about politics, giving them the right to vote is not what is best. Our mission is very simple. Educate, and inform people about what is going on in politics while keeping it civil and sophisticated.